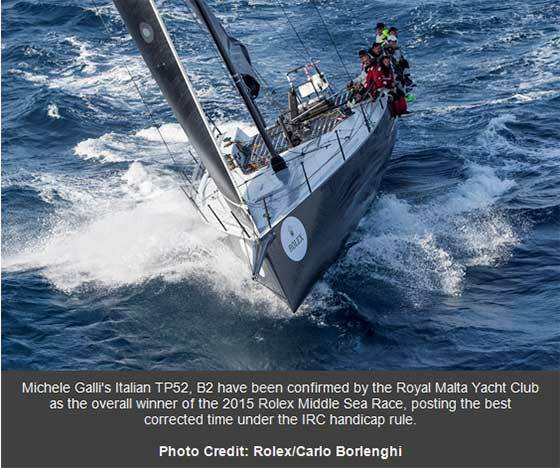 Michele Galli's Italian TP52, B2 have been confirmed by the Royal Malta Yacht Club as the overall winner of the 2015 Rolex Middle Sea Race, posting the best corrected time under the IRC handicap rule. After over three days of racing, B2 was the IRC winner by seconds from Vincenzo Onorato's Italian Cookson 50, Mascalzone Latino. The narrow victory was exemplified by the fact that Mascalzone Latino was the overall winner of the ORC class. "Crossing the finish line with an advantage of nine seconds, on corrected time, was a big surprise, but even having losing to Mascalzone we would have been happy, because we know both teams did a great race and we both would be fair winners." Commented B2's navigator, Nacho Postigo. "I think the 50-52 feet is a good length for this race. The TP52 is an all-round boat, with very little weaknesses, a good compromise between rating and speed. For me this was a typical Middle Sea Race; you struggle to find the wind, and when you do, it happens in excess. This time it was more about managing the light than about strong winds. For me, this is one of the most challenging races in the world. In this race there is a strong association between land and sea, and this drives you to take many important decisions along the way; sometimes, mistakes are really expensive here. It is similar to races like the Fastnet or the Caribbean 600 in terms of dealing with the islands, whether you stay offshore or you get closer. We have a great team on B2, Francesco De Angelis is a very motivating person, always pushing. Michele is a fantastic owner, very competitive, and he really loves these offshore races. And then the rest of the crew: I don't know the number of peels we've done in these three and a half days, but they were simply perfect." Michele Galli and his team will receive the Rolex Middle Sea Race Trophy at Saturday's Prize Giving Ceremony. This is the second occasion that Michele Galli's TP52, B2 has won the trophy, winning the race overall in 2013.